Typically, the back remains in one position and the anterior trunk support is dynamic. 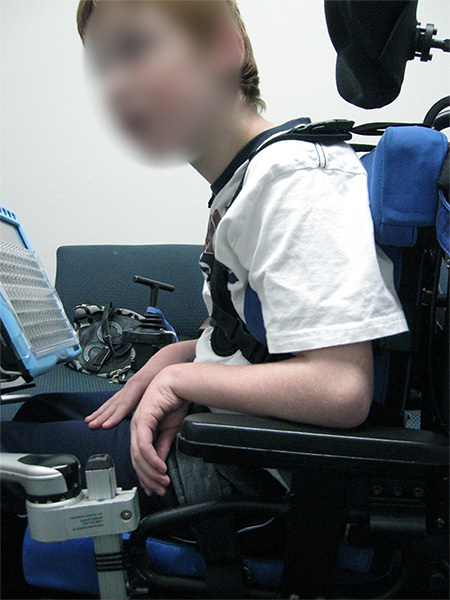 For example, the client can then lean forward to reach something, and is assisted back by the energy built-up in the dynamic anterior trunk support. The trunk support material and/or mounting straps are usually elastic in nature. Some clients will tend to “hang” on dynamic anterior trunk supports if the material is inadequate to assist with return to upright. It is recommended that you trial this intervention out with an individual client prior to a final recommendation. Dynamic anterior trunk supports work well for clients who are able to volitionally lean forward, but who require some assistance to return to upright. Leaning forward may extend functional reach, provide a pressure relief or just be used to provide movement (for comfort or for the sake of movement). If a client tends to hang on a dynamic anterior trunk support, check their overall positioning to ensure that the seating system is optimizing trunk control. For example, the seat to back angle may be too closed. These adjustments may help the client to successfully use this dynamic seating component. Let’s keep the conversation going! What is your experience when using dynamic anterior trunk supports? Just leave a comment, I’d love to hear from you!